I don't know if I am more horrified that this school exists, proud of parents for standing up to the lack of play in kindergarten, or saddened that I'm not all that shocked by the article. 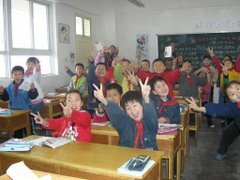 The New York Times reported that parents complained about the lack of unstructured play in kindergarten. The school, who also sends home packets of worksheets for the kindergarten students to complete every week responded by granting the five year olds thirty more minutes of PE a week. I am not sure that PE was the type of unstructured play that promoted brain development the parents had in mind. I imagine these days you'd be hard pressed to find a public elementary school that doesn't have significantly less unstructured play than it did ten years ago. There is simply to much at stake in the short term to let our children play. But educators who understand child development and are comfortable sacrificing short term gains for long term cognitive growth tend to find creative ways to stick play on throughout the day. What saddens me the most is that this story truly shows the giant gap between research and practice that exists in education today. Although current research supports play and presents ways of initiating play in the classroom to boost cognitive skills, education policy makers, unfamiliar with child development or education research, ignore these studies. Worse yet are those who feel that play should be doled out as a "reward." When the scores go up, then you can have recess. This is what exists all over Australia. I know it's Kindergarten but we do have a curriculum to teach to. Some parent has conned the newspaper to write about the poor five year old children being forced to toil over worksheets. Subscribe here to receive my weekly Storytime Connection newsletter that provides literacy activities to support your child's developmental needs. I choose one book a month and provide literacy, language, motor, sensory, and emotional activities that connect with the book. Subscribe to OC! Get new posts straight to your inbox. 50 kids, 25 desks, no heat, pure happiness. Chinese Translation, Xian, China. 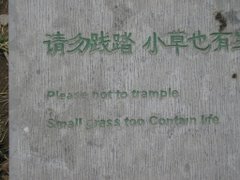 "Please not to trample. Small grass too Contain life"
Stories from inside the Think-Tank: an extremely diverse public elementary school located outside of Washington, DC. Check out what we need for our dream retelling center! Help us show our understanding of stories and literacy through play. Follow our research as we determine if using objects to retell improves comprehension and oral language development in ELL students with disabilities. We can do hard things, I swear.